Wonderful scenery, sandy beaches, wild swimming, clean sea air, recharging your batteries interesting towns, stunning national parks, great Mediterranean food. North Dalmatia includes the city of Zadar and the mainland coast to the north and south. It is particularly known for beautiful sandy beaches and for national parks. Zadar is famous for its historical monuments, good food and culture, and more recently for its sea organ and the Greetings to the Sun ceremony. For hard clubbers, visit Zrce beach on the island of Pag and Tisno adjoining the island of Murter, but all the rest of this beguiling region is just wonderful scenery, wild swimming, clean sea air, recharging your batteries and enjoying interesting towns and great Mediterranean food. This is the fruit basket of Croatia, with hectares of fruit trees, famous for cherries and the Maraschino cherry liqueur. The whole area is a UNESCO Biosphere Reserve. The biggest freshwater lake in the country and Lake Vrana Nature Park, the lovely karst river of Zrmanja and the Velebit mountain range with Sveto brdo reaching a height of 1,700 metres above sea level. Also worth a visit are towns of Nin, Privlaka (sandy beach Sabunike), Bibinje, Biograd na Moru (Red Bay warm sandy beach with rocky parts and great for snorkelling), Turanj and Vodice. 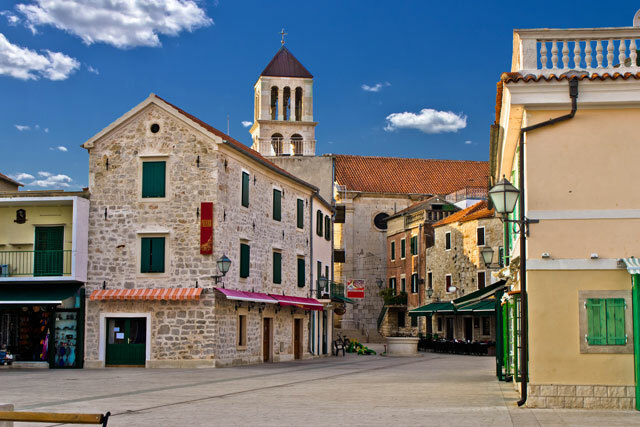 The town of Nin is particularly charming and historic, and has enormous sandy beaches, (Queen's Beach is 3km long), whilst Vodice is an excellent place for beach parties and nightlife. Dugi Otok, which means Long Island, has one of the most beautiful sandy beaches called Sakarun, covered with sugar like sand around a shallow bay of green-blue sea, shallow and prefect for swimming.On the lively Zrmanja River you can do white water rafting, kayaking, paddling school, boating and hiking tours. The annual Paklenica Trail International – a trail running race in which racers traverse the stunning Velebit Mountains in the Paklenica National Park. In the beautiful Telašćica Nature Park on Dugi Otok you can see wild donkeys.